The Buzzidil baby carrier is a very adjustable carrier available in 3 sizes, babysize (0-18 months), standard size (2-36 months) and XL (8-48 months). The standard size is suitable from about 2 months up to 36 months approximately. This baby carrier should be a faithful companion on your carrying journey as it would offer a perfect fit for both little babies and toddlers. The front panel is very easy to adjust and change the size of, there is no velcro or poppers or complicated systems. The width of the panel is reduced via a system of two toggles on the front panel which also reduces the height. There is an additional adjustment on the top of the panel to further reduce the height if needed. Unlike other baby carriers there is no steps in the adjustment of this carrier but one smooth transition fitting your baby perfectly at all times. You can do front, back and hip carries and the straps can cross on your back if desired, thus appealing to a wide range of anatomies. Avoids pressure point on the spine. For young babies under 6 months the straps can be connected onto the waistband to avoid pressure point on the spine. 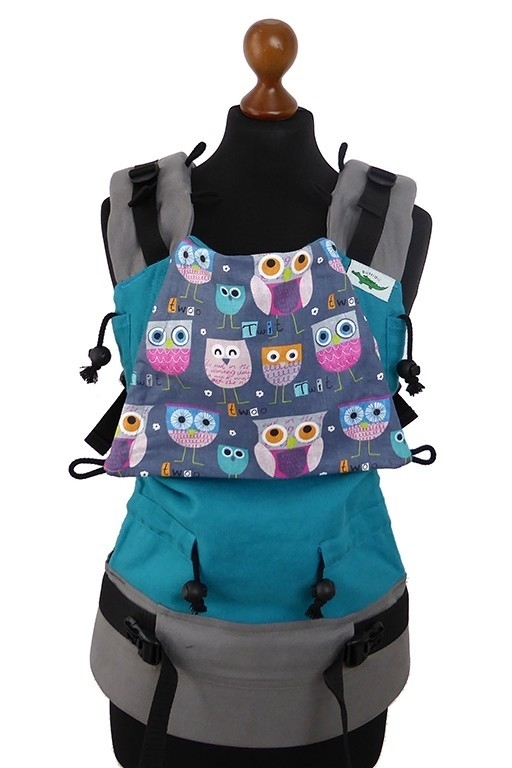 for toddlers with advanced development of their back (> 6–8 months) shoulder straps can be connected to the front panel: weight is evenly distributed between hips and shoulders of the person carrying the baby. Buzzidil uses quality material only (sling wrap is mainly woven in Austria according to the strict Austrian quality regulations; for shoulder and hipbelt Buzzidil uses mainly organic cotton being tested for their resistance to saliva; Duraflex quality buckles). To prevent manipulations of the buckles on the shoulder straps by toddlers and accidential opening, Buzzidil baby carrier uses 3-point-security buckles. The Buzzidil Babycarrier is patented. H = hands free. Are you hands free? If not, some more adjustment/tightening of the carrier is needed. A = airway. Can your baby breathe? There must not be anything covering your babies face. N = knee to knee support. Check that the carrier fits your baby from their bottom to the backs of each knee. D = deep seat. Is your baby seated deeply (deckchair style) into the carrier?-with their bottom lower than their knees. S = supported. Is it a comfortable carry for both you and baby? Seek help/support from Oxford Sling Library if you need it. Your baby's safety is of paramount importance.